Privatization of school support services is a time-tested means for lowering educational costs. The three major services that school districts in Michigan contract out for are food, custodial and transportation. 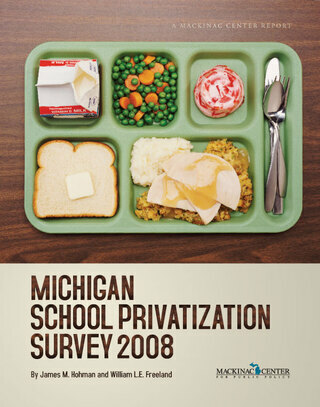 The Mackinac Center for Public Policy's survey of privatization is the longest running and most comprehensive source of school support service data in the nation. [*] The number of operating conventional school districts in Michigan is not always the same from year to year. There were 552 districts in 2007, but 551 in 2008 as White Pine Public Schools enrolled no students for the current year. In this study, we have used the number of operational school districts to calculate and compare school district contracting rates in different years, meaning that the contracting rate in any given year may not be based on the typical 552 school districts. Also, as of writing, we have been unable to receive a response from Detroit Public Schools from our Freedom of Information request. The district has been excised from this year's count, leaving 550 districts.